Concrete patios might seem old-fashioned nowadays, when laminate wood and artificial stone have become more prevalent, but there are many reasons why experts in patio design in Suwanee recommend a concrete patio for any home. 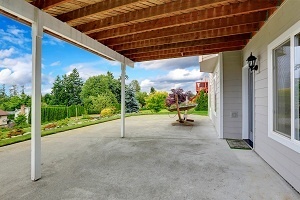 If you are building a new home or want to expand your outdoor living opportunities, here are several reasons why you should look into concrete first. It's tough to be versatile with a wooden deck or another material that lends itself to a few particular design schemes. Concrete allows you to build virtually any type of outdoor living style, from an Old World dining experience to a rustic outdoor living room. Flat concrete and concrete patio pavers, which resemble bricks, give you a neutral surface on which you can extend your design goals in any direction. There are very few ways to customize wood and artificial stone because some of these materials only take few types of finishes. Concrete pavers, however, have a variety of color, design, and pattern options for you to consider, from stamped patterns and penciling to engraved texture. Your patio hardscape should blend seamlessly into your home's architecture as well as your landscape scheme, so it's best for you to invest in a material you can customize in a wide variety of ways. Few materials are as fussy as wooden decking. Concrete can tolerate furniture, foot traffic, a wide range of weather conditions, UV rays, and moisture. You'd be shocked how many patio materials on the market are not built to handle the rigors of the outdoors. Also, you'll never have to refinish the material for any reason, while other materials require re-staining and sealants. Concrete can be customized to resemble other materials at a fraction of the cost. Concrete is also quick to install. It's simply framed, poured, and smoothed out, then allowed to dry. This can save you a great deal of money on labor costs. Because the materials are cheaper, concrete patios can be made larger and in a variety of formations. Why pay just as much for a compact patio as you would for an extensive and versatile patio? You might even be able to boost the value of your home when you invest in concrete! 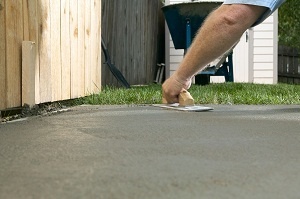 Experts in patio design in Suwanee can quickly and easily install a concrete patio on your property. There are many reasons to choose concrete, and patio design experts can even help you customize your design so that you get the most out of outdoor living.